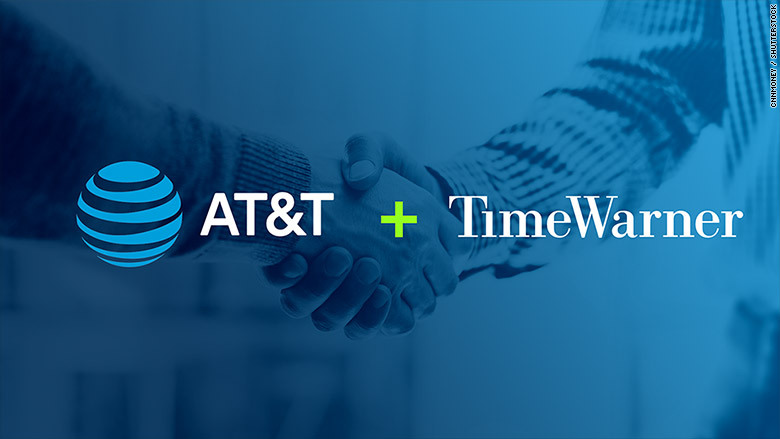 AT&T Time Warner Deal: Time Warner Cable (TWX) Merger with AT&T: “Too Big” to Exist? AT&T for months has been facing off against the Department of Justice which is seeing to block its merger deal with Time Warner, which controls channels like HBO, CNN, and Warner Bros. Studios. AT&T says the deal would allow it to compete with firms, like Netflix and Amazon, which are seeking to dominate online streaming. The government is arguing the combination would give AT&T too much power and ultimately would lead to higher prices for consumers. Chief Executive Randall Stephenson tells a judge the DOJ's antitrust claims against AT&T's purchase of Time Warner Inc. were “absurd” rejecting the government’s arguments that the enlarged company would use its powers to raise prices. AT&T Inc. (NYSE:T) is the second-largest wireless telecommunications provider in the United States, with nearly 190 million subscribers nationwide (including landline), and more than 116.6 million mobile customers. As of May 2014, according to Forbes, T is also the twenty-third largest company in the world, and the sixteenth-largest, if we exclude oil. While the company experienced a very problematic phase when it implemented its 3G network, and while investors seem to see it as a problematic stock, given its competition with Verizon (NYSE:VZ) and its failure to meet Wall Street expectations, T may not be as poor an investment as it is painted to be, given recent developments and its steady dividend. Analyst opinion and public reception reveal that AT&T's progress has not gone unnoticed. T recently won two innovation awards at the Mobile World Congress, one of them for Digital Life. Analysts are also not overly critical -Yahoo! 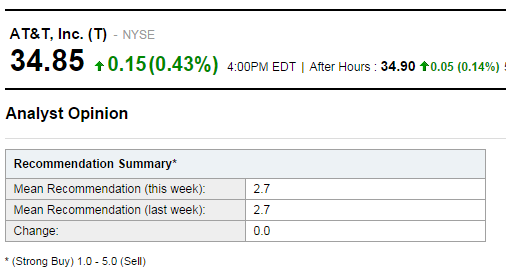 Finance calls T a solid hold, as does Reuters; the Motley Fool goes so far as to label T a moderate buy (Figures 1, 2, 3).